QUESTION: "After getting my Good News today, I looked twice to see if I had made a mistake in seeing a book for sale called The Envoy. I thought all your literature was sent free of charge." ANSWER: Over the years we have offered The Envoy (the Ambassador College student yearbook) exclusively to the baptized members of the Worldwide Church of God. These Church members have always expressed great interest in the activities of the Ambassador student body. 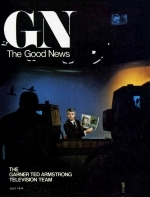 However, with the November issue we expanded The Good News circulation to include our co-workers, donors and others interested in the Work of God. We thought they too would appreciate knowing about the availability of the College yearbook. The Envoy contains full-color pictures of Mr. Herbert W. Armstrong and Mr. Garner Ted Armstrong; photographs of faculty members, administrators, and the entire student body of all three campuses; plus student highlights throughout the entire year. But in offering this beautiful publication to our expanded mailing list, we must emphasize that The Envoy is not a part of the publishing of the gospel. It is not a religious publication heralding the Kingdom of God as a warning and a witness to this sick and dying world; nor is it a publication instrumental in feeding God's flock. Selling The Envoy does not compromise the biblical principle of "freely ye have received, freely give" (Matt. 10:8). It is not gospel literature. If you are interested in obtaining a copy of The Envoy, please see the back cover of the June issue for the essential details. Q: "I have heard from several different people that it is very difficult to join the Worldwide Church of God. Members are supposedly very carefully screened before they are even allowed to attend a meeting of the Church. What is the story behind membership in your Church?" A: Actually, God's Church is not something one can "join." God Himself puts a person into His Church (John 6:44), which is the spiritual body of Christ (I Cor. 12:13). God does require certain prerequisites before He will add a member to the body. Acts 2:38 is an anchor verse to consider: "... Repent, and be baptized everyone of you in the name of Jesus Christ for the remission of sins, and ye shall receive the gift of the Holy Spirit." I Corinthians 12:13 further tells us: "For by one Spirit are we all baptized into one body [the Church], whether we be Jews or Gentiles, whether we be bond or free; and have been all made to drink into one Spirit." Anyone who meets the biblical qualifications - without respect of persons and regardless of race, color or previous creed (see I Corinthians 12:13 again) - is admitted to membership in the Church of God by God Himself. And our Bible studies are open. If you inadvertently were to walk in on one of the Worldwide Church of God services, you certainly would be warmly welcomed and allowed to remain if you wished to do so. For further information request our free, full-color booklets entitled Where Is God's True Church Today? and This Is the Worldwide Church of God. The latter publication presents the story of a Church that practices Christianity as a way of life as well as a faith - even as the first-century Church did in the days of the early apostles. Q: "I have been reading your booklets and magazines for some time and I agree with the fact that religion is a way of life. Many times I find myself in a position where I am asked what religion I am. Exactly what would you tell them? When I tell them we have no specific name for it, they can't understand. How could I explain it without getting into an argument over religion?" A: No arguments are necessary! Simply tell them you are associated with the Worldwide Church of God. If you would like to know more about the teachings of this unique Church, simply write and ask for a private appointment with one of God's ministers. We will be happy to arrange a personal meeting with one of these dedicated men.